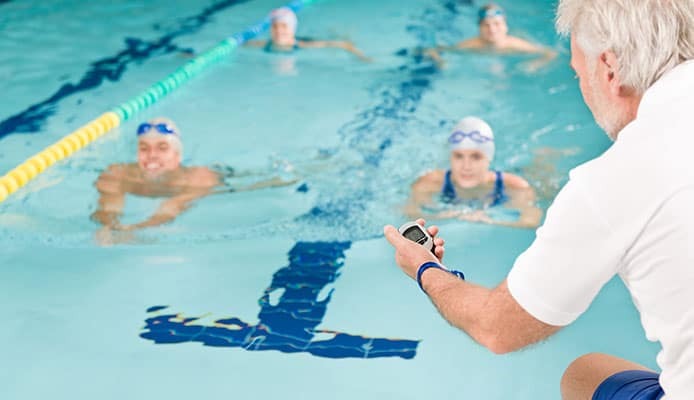 A stopwatch is a valuable piece of equipment for every swimming coach. No matter if your athletes are practicing or competing, tracking time gives you insight into performance and progress. Stopwatches are one of the easiest ways to track your swim workout, so you get a clearer picture where and how to improve. We’ve compiled a buying guide to help you find the best coach stopwatch, and also selected some fantastic products to make your choice easier, so take a look. 6. LapCounter and Timer by SportCount, Inc. 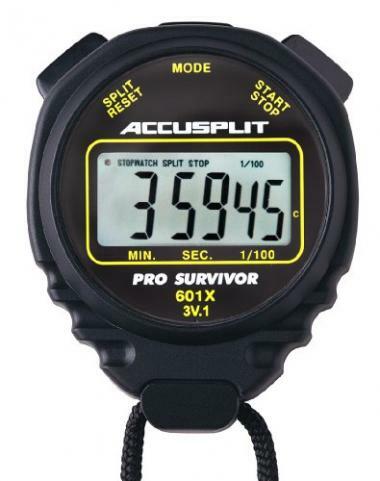 The Pro Survivor stopwatch comes with a large display and a handful of added features. The extra-large digits are very easy to see, and it’s able to measure cumulative splits. Like all high-quality products, it has a 1/100th second timing interval. Additionally, it has a calendar function too. The shock and waterproof case is ergonomic and very comfortable to use. 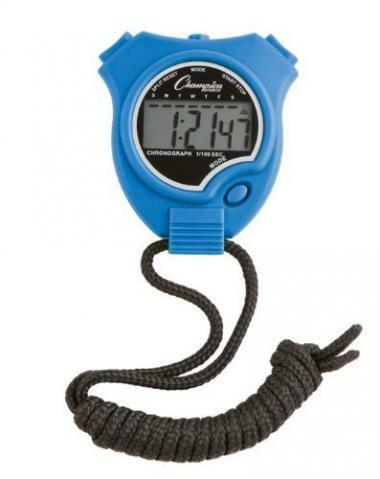 It’s truly one of the best swimming stopwatches out there, and it comes in many nice colors too. This water resistant stopwatch is compact and easy to use. You have three color choices, and you can even buy a large pack at a lower price. It shows minutes, seconds and 1/100th of a second, and you can split time too. The laser tuning ensures great accuracy, and the hard casing guarantees durability. 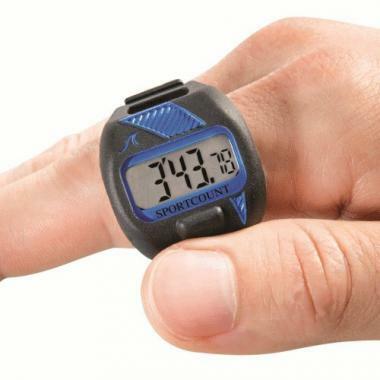 In addition, this top rated coach stopwatch comes with 46” lanyard too. Here we have a slightly different design. It’s simple to use – you have a large on/off button and two operation buttons on top. The display is clear and large, and this lightweight coaches stopwatch performs only basic time measuring functions. It’s made of hard plastic so it doesn’t break easily, and unlike, this one runs on AAA batteries which are included in the package. Finis is a renown manufacturer, and many swimmers like and use their kickboards, pull buoys and swim caps. They also make some of the best coach stopwatches you can find. It has a water resistant, ergonomic body with three buttons on top. The display is large and divided into three areas. This product can memorize 100 entries so you can review cumulative and lap splits. It also automatically calculates stroke rate. It’s simple and easy to use, with top-notch build quality. Here we have a colorful product, if you want to introduce some fun into your daily routine. It’s equally popular among coaches and kids. It has three differently colored operation buttons – green, yellow and red. Measuring 3 inches in diameter, the body is round and nice to hold. 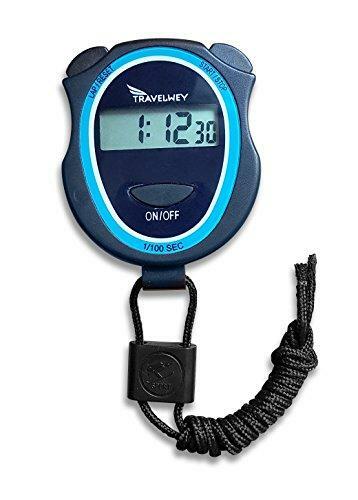 The stopwatch shows minutes, seconds and 1/100th of a second, and you get it with a battery and lanyard included. LapCounter and Timer by SportCount, Inc. 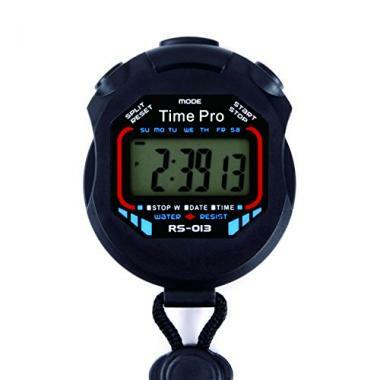 This is an unusual stopwatch which can be used as a replacement for waterproof watches, since swimmers can have them on while practicing. It’s a small stopwatch that goes around your index finger and has an adjustable band to tighten it. You operate it using a single button, and it shows time, split time, cumulative time and lap count on a large screen. It’s waterproof up to 50m, and comes with a 1-year warranty. The ProCoach stopwatch for swimming is a very straightforward product which offers excellent value for money. There are three display modes for different functions, and the stopwatch measures 1/100th part of a second. It’s lightweight but also well-made, and the water resistant body means you don’t have to worry about occasional splashes. 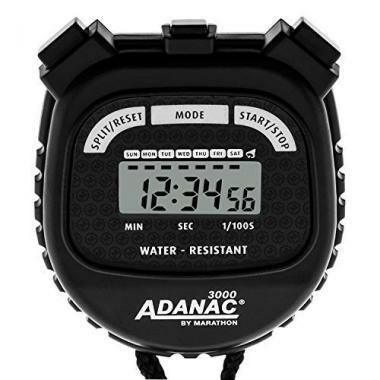 This swim stopwatch features a nice, large display and three easy-to-operate buttons on top. In addition to time, it counts laps, and has calendar and alarm functions. The body is water and shock resistant so you can count on it to last a long time. Finally, you can choose among five colors when buying. When you start working with kids, you’re helping them learn how to swim. As time goes, some children become competitors and time starts to play a large role. 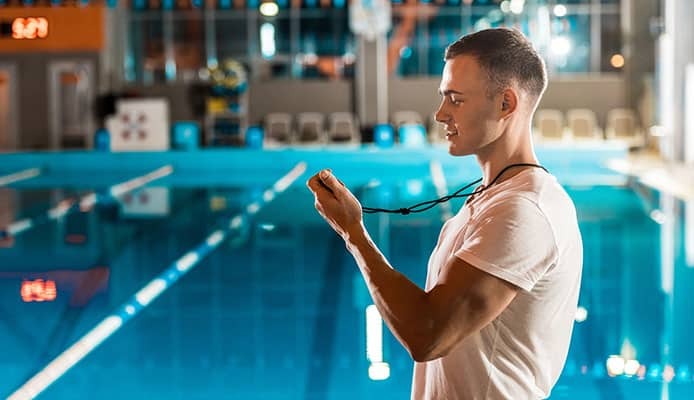 This is why every swim coach needs to have a stopwatch which is reliable, durable and easy to use, so you can concentrate on the training session and get the most out of it. It’s important that you can count on your stopwatch for swimming to show the times with great accuracy. This means proper calibration, and precision which goes to 1/100th part of a second. All of the products we featured in our swimming stopwatch reviews will do this and record split times, while others can also time laps and memorize the data. While on this topic, it’s a big plus if the stopwatch keeps working normally even after you’ve dropped it or gotten it wet, which is inevitable to happen. Since you’ll be using it around the pool, your new stopwatch should handle water well. Not all stopwatches can do this, so pay attention when buying. Also, there are certain differences between water-resistant and waterproof products. Water-resistant stopwatches can be only splashed with water, while waterproof products can be safely submerged into the pool. If you want to learn more about this, read our water-resistant vs. waterproof article. While this has nothing to do with functionality, it can make things more fun. 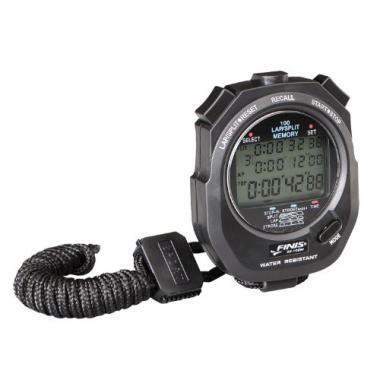 Several products we featured offer a color choice, so your stopwatch isn’t black and boring. Some even have a multiple-color design, which in combination with simple functions makes them great for children too. The display is perhaps the essential part of your swimming timer clock. Make sure it’s large enough, and the digits are easy to read. This way you can simply glance at the stopwatch instead of wasting your time trying to read it. Some displays show different information simultaneously (without changing modes), which can be a plus. Finally, some stopwatches have backlight, making the display more visible in low-light conditions. Most stopwatches out there have three buttons, but there are exceptions. The number is not important, as long as they are functional. Usually you will get a start/stop, mode and reset buttons. They need to be easy to press, accessible to your fingers even when using the stopwatch with a single hand, and they should not jam after continuous use. Like we said, the stopwatch is going to be exposed to some rough treatment around the pool. Look for a product that has a tough casing – usually hard plastic, and preferably with some rubber protection too. This type of reinforcement ensures shock protection so your stopwatch will keep working even if it hits the ground. No matter which swim timer you get, a user manual will come in the package. However, some products are more user-friendly than others. Take your time and choose a stopwatch which gives you easy access to all the functions without getting on your nerves. Q: What Are The Benefits Of Using A Stopwatch? A: Stopwatches give you precise information about the performance of your athletes. With it, you can motivate them and give them hints on how to swim faster. In addition, stopwatches are more straightforward and easy to use compared to watches. Q: Are All Stopwatches Waterproof? A: No, not all of them are. This depends on the way they were constructed. If you plan to submerge it into the pool, make sure you buy one of the waterproof stopwatches. Otherwise, a water-resistant stopwatch will also do the trick. Q: How To Care For My Stopwatch So It Lasts Longer? A: For starters, get a product which is made from tough materials, and is also resistant to shock and water. Many products come with various clips and lanyards for securing them. Nobody drops their stopwatch on purpose, but putting it around your neck or wrist greatly reduces the chance of it falling down and breaking. Tracking time is very important for competitive swimmers, so both athletes and coaches can track the progress and find ways to improve performance. Like we discussed, finding the best swimming stopwatch depends on what you need – a basic product or one that has an abundance of functions. We don’t have any doubt you’ll find the right one to make your training sessions better and more effective. 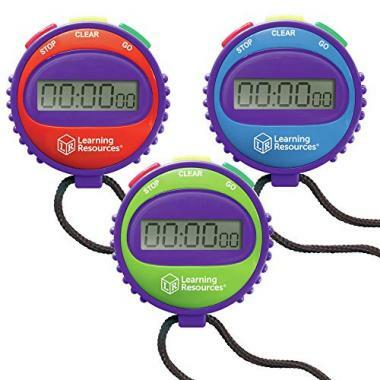 Have you tried a stopwatch for swim coaches that made it onto our list? How are you satisfied with functionality? What about durability? Please share your experience with us in the comment section below.